i want to print several pages on my form, but I can only print the page with the submit button. i have several page separaters on my form and i want to print those pages, but I am unable to print them because I can only put the print button next to the submit button. When i press print it only prints that page. can you help me? 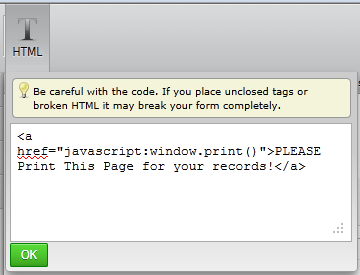 You may add a Print button in each page of your form, as suggested by a JotForm user in this related thread. Hope you find this useful. Thanks! thanks neil. That helps a lot. It's nice to know that your concern has been resolved. If you have other questions or concerns, please do let us know. We'll be happy to assist. Maybe this is stating the obvious, but it would be really nice if "Print Form" actually printed the entire form, not just the last page. Certainly my users would find it much more convenient to hit print once -- and save paper -- rather than remembering to hit print at the bottom of every page. Maybe this can be an option in the future? @ewc, Let me please inform you that mentioned feature has been already added to our To Do List, and we hope it will be implemented in the near future. We will update this thread once the feature will be available. For now I have eliminated the page breaks on the form, so all the form fields are on one page, which allows the print button to work well. Sorry for the extremely delayed update, but I'd like to inform you that form pages are now printable. Please do try it out and send us your feedback.